Teledyne CARIS™ is pleased to announce the release of Hydrographic Production Database (HPD)™ 3.2. As part of the CARIS Ping-to-Chart™ solution, HPD offers an integrated suite of products for managing data in a seamless database, providing simultaneous data compilation by multiple users. This release offers exciting features which will allow HPD users to implement new workflows, create new products, and obtain even more value from their database. HPD 3.2 expands the range of products that can be generated. 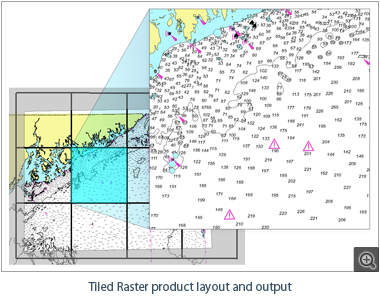 The Tiled Raster product creates image tiles from usage data, which can be served as background data for use with on-line services. The new Atlas production capabilities have been developed to organize small craft charts and river charts, into packages. Additional documents can be added, customized, and updated during chart maintenance operations. These capabilities are available as part of the Publications Module™. Batch processes have been created to support the Tiled Raster and Atlas product functionality and database features can be Added, Deleted or Updated offering new possibilities for automation and efficiency. HPD 3.2 brings extensive improvements to the paper chart presentation styles ensuring conformity with the IHO S-4 Ed 4.6.0 standard. The enhanced symbol library, presentation and marginalia instructions bring the first cut of a chart much closer to a print-ready state. Furthermore cartographic features can now be stored directly in the Source database with HPD 3.2. HPD users with Oracle® 12c can now use a single sign-on using their Windows® credentials for all HPD applications.